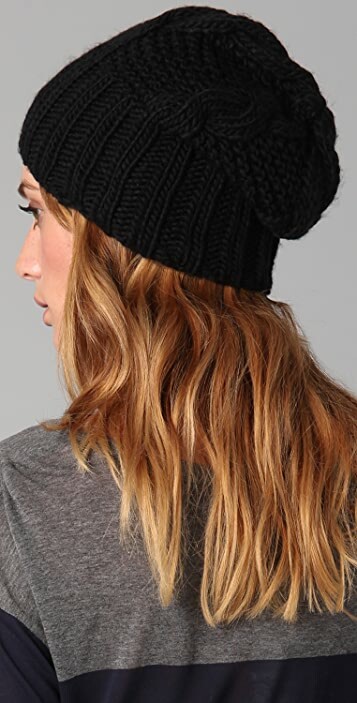 This cable-knit hat features a ribbed edge. This hat is definitely cute! But there's no elastic in it, so it sometimes feels like it's going to fall off. Wasn't ideal for a Chicago winter-- would have blown right off! I always have trouble with hats and don't really know how to rock them, but this one is a no brainer. Perfect slouch and just the right fit and soft! Get it! Though I can't say I'm entirely disappointed with this purchase, I will say that I was hoping for a little more: I thought the hat might have a little more 'slouch', be a little thicker for that truly warm thick feel. The photos are not inaccurate; however, if I'd have known it was small and not as thick as I thought it might have been - I think that I'd have just saved a little longer then went ahead and splurged on a Eugenia Kim knit hat. They are far more expensive, but I have a feeling I would get enough wear out of one of hers to justify the purchase. Unfortunately, I cannot say the same for this one - even though it was only $58. It doesn't really look or fit the way it does in the picture. Grr. This is a very soft hat. I like to wear mine closer to the head so I cuffed it. Looks great, is very warm. this is a great lil hat for the winter, its loose and floppy in the right way. this look never goes outta style! 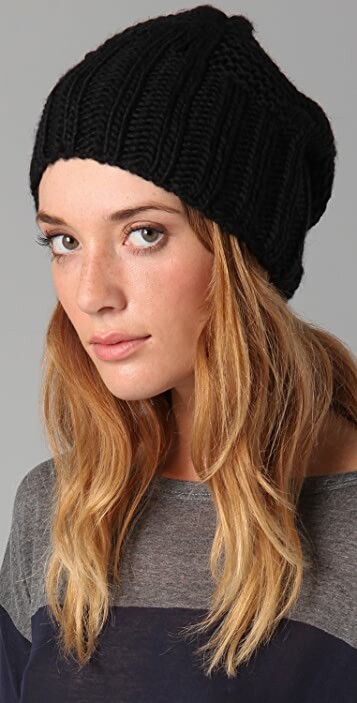 I have been searching for the perfect beanie that is not too big with just the right amount of slouchiness. This is THE ONE!!! I will be rocking this beanie with everything because it adds a little something to every outfit in both the casual and dressy variety. The very reasonable price tag is just the icing on the cake. Get it. You won't regret it for one second.